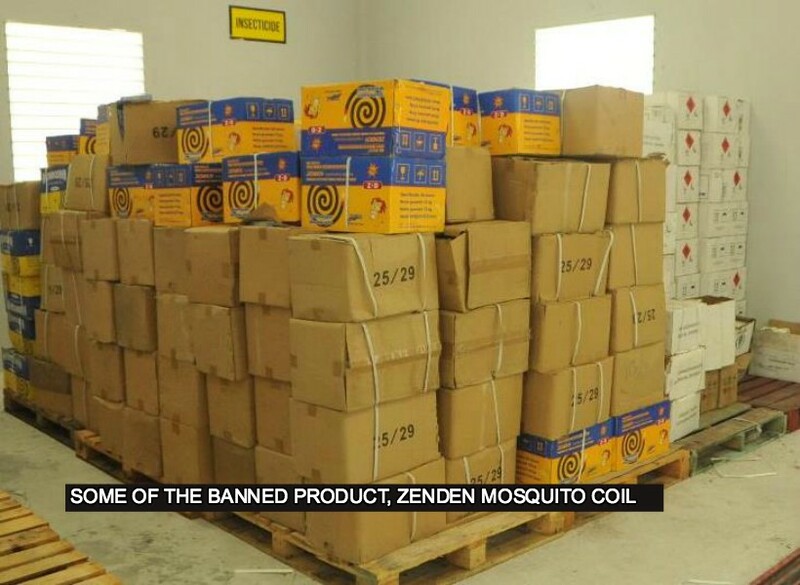 The suspected cancer-causing Chinese-made Zenden mosquito coil has been denied registration by the Pesticides and Toxic Chemicals Control (PTCCB) Board of Guyana for its suspected risk to human health and the environment. The mosquito coils have been an area of focus for the authority for quite some time now and this denial of its registration prohibits the import, distribution, sale, and use of the product in Guyana. Mosquito coils are widely known as an efficient mosquito repellent. When a mosquito coil is burned, the insecticides evaporate with the smoke and prevent mosquitoes from entering the room. However, exposure to the mosquito coil smoke poses both acute and chronic health risks and, according to the PTCCB, these risks are present with Zenden. According to reports coming from the Pesticide Board, the product has long been suspected to be linked to cancer and its smugglers have thereby made little effort to register it. A recent registration submission for the Zenden mosquito coil revealed the product to be a Class 1A carcinogen. This means that the product is “known to cause cancer in humans”. The product is also said to have the potential to cause germ cell mutation in humans. It is classified as a highly hazardous pesticide (HHP) and poses significant risk to human health and the environment. Furthermore, the registration data submitted had numerous other areas of non-compliances, according to information released by PTCCB. The PTCCB has spent years confiscating and disposing of these illegal “Chinese-made mosquito coils” through numerous enforcement exercises. Moreover, the PTCCB has been and continues to raise awareness on the illegality and possible risks to human health and environment. The PTCCB began confiscating illegal mosquito coils in 2008 and to date has confiscated 4,435.08 kg (4.4 tonnes). Of these, approximately 778.80 kg of these confiscated mosquito coils were Zenden. Meanwhile, the process of pesticide registration allows the PTCCB to examine the toxicity characteristic of pesticide products to human health and the environment. It therefore allows for more informed decision making regarding the import, distribution, sale, and use of such products in Guyana. Currently, the brands of mosquito coils that are registered for sale and use in Guyana and are therefore recommended for use by the PTCCB are Fish, Protox, Baygon, Raid, Vape and BOP. The PTCCB said that it is committed to continued enforcement activities targeting importers, distributors, and retailers of these illegal mosquito coils. This is in keeping with the PTCCB’s mandate to eliminate the importation, sale, and use of illegal pesticides, thus reducing their availability.